There is a school of thought that black and white photography gives somehow a more satisfyingly realistic picture of the world, and though video still struggles to achieve the density of image of a 35mm frame (let alone that of large-format photography), it shares something of that realism. It is as if the machinery of video seems too simple, too direct, to be capable of lying. Instead, when it lies, it tells you so, like a child trying to act a part - one thinks here of Wegman's Selected Video Works, especially the singing torso. But like the child, monochrome was very self-conscious, a quality that returns throughout David Hall's work in the medium. When, after working through his earlier video works, you come to This is a Television Receiver, there is a sudden burst of colour that asks what is (or what was) monochrome as a TV format? Now it is obsolete as a broadcast medium, what were its virtues? 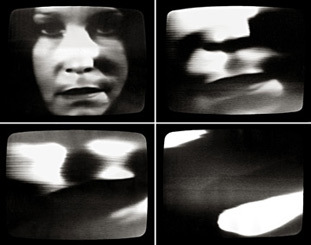 What precisely was its materiality for those decades when monochrome was television? Maybe it's too soon, or more likely it's already too late to quiz the black and white image, and maybe it always was painted the colours of imagination. But then again, describing those earlier images as 'black and white' is a polite fiction. There was no video black at all back then (and many argue there still is not), but a palette of soft and softer grays.